Hypatia of Alexandria (in Greek: Υπατία) (c. 370 C.E. – 415 C.E.) was a popular Hellenized Egyptian female philosopher, mathematician, astronomer/astrologer, and teacher who lived in Alexandria, in Hellenistic Egypt, just before the advent of the Dark Ages. Her father Theon, a mathematician and the last fellow of the Museum of Alexandria, educated her in literature, science and philosophy, and gave her credit for writing some of his mathematical treatises. She became head of the Platonic school in 400 C.E., and lectured on philosophy and mathematics to large audiences which included some prominent Christians. 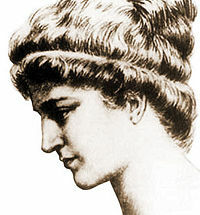 Hypatia also studied science and mechanics, and her contributions to science are reputed (on scant evidence) to include the invention of the astrolabe and the hydrometer. None of her written works have survived, but several works are attributed to her by later sources, including commentaries on Diophantus's Arithmetica, on Apollonius's Conics and on Ptolemy's works. In addition to being a philosopher, mathematician, and scientist, Hypatia has been held up as an example of the Platonic ideal of equality of the sexes, and as a model of virtue by some early Christians. She also became a martyr and a symbol of the way in which early Christian zealots attempted to suppress the “pagan” Hellenistic thinkers. The only primary source for personal information about Hypatia is The Letters of Synesius of Cyrene, written to her by one of her students, Synesius, the Bishop of Ptolemais. Several of these letters are still in existence. Two contemporary Christian historians, Socrates Scholasticus of Constantinople and Philostorgius of Cappadocia, left written accounts of her life and violent death. Hypatia, the daughter of Theon who was a mathematician and the last fellow of the Museum of Alexandria, which was adjacent to or included in the main Library of Alexandria. By the time she reached maturity, Hypatia is said to have acquired all existing scientific and philosophical knowledge of the time. She received pupils in her home, and gave public lectures in Athens and in Alexandria. Hypatia became head of the Platonist school at Alexandria around 400 C.E., where she lectured on mathematics and philosophy, and counted many prominent Christians among her pupils. No actual images of her exist, but nineteenth century writers and artists envisioned her as an Athene-like beauty. It has been suggested that Hypatia was the originator of several scientific inventions, including the pane astrolabe, which used a pair of metal disks that rotated one on top of the other around a removable peg to measure the positions of the sun and stars. She presumably created a device to measure the level of water and a distillation system, as well as the hydrometer, a sealed tube with a weight at one end which could be used to measure the specific gravity of a liquid. None of her written works remain but several works have been attributed to her by later writers, including commentaries on Diophantus's Arithmetica, on Apollonius's Conics, on Euclid’s The Elements, and on Ptolemy's Almagest. Hypatia never married, rejecting all suitors, and was later proclaimed a symbol of virtue by some early Christians. She was widely respected as a person of dignity and character, was an excellent orator and a teacher and advisor to numerous prominent leaders. Hypatia died in Alexandria in 415 C.E. at the hands of a violent mob. Historians have offered various explanations for the attack, which appears to have stemmed from the efforts of the early Christian church to eliminate institutional paganism. For some scholars, Hypatia’s death is a symbol of the suppression of the logical and reasoning pagan philosophers by irrational religious fanatics. As the early Christian church strengthened its political power, it began to regard the Hellenistic philosophers as a threat and their teachings as heresy. In 391, Theophilus, the Patriarch of Alexandria, destroyed some pagan temples in the city, which may have included the Museum and certainly included the Serapeum (a temple for the worship of Serapis and "daughter library" to the Great Library). In the same year Emperor Theodosius I published an edict prohibiting various aspects of pagan worship, whereupon Christians throughout the Roman Empire embarked upon a campaign to destroy or Christianize pagan places of worship. In 412 C.E. Cyril, the Patriarch of Alexandria, vowed to rid the city of neoplatonist "heretics." Their philosophy consists in a very simple formula, that of calling God to witness, as Plato did, whenever they deny anything or whenever they assert anything. A shadow would surpass these men in uttering anything to the point; but their pretensions are extraordinary. In this letter, he also tells Hypatia that "the same men" had accused him of storing "unrevised copies" of books in his library. This suggests that books were rewritten to suit the prevailing Christian dogma. Yet even she fell a victim to the political jealousy which at that time prevailed. For as she had frequent interviews with Orestes, it was calumniously reported among the Christian populace, that it was she who prevented Orestes from being reconciled to the bishop. Some of them therefore, hurried away by a fierce and bigoted zeal, whose ringleader was a reader named Peter, waylaid her returning home, and dragging her from her carriage, they took her to the church called Caesareum, where they completely stripped her, and then murdered her with tiles. After tearing her body in pieces, they took her mangled limbs to a place called Cinaron, and there burnt them. This affair brought not the least opprobrium, not only upon Cyril, but also upon the whole Alexandrian church. And surely nothing can be farther from the spirit of Christianity than the allowance of massacres, fights, and transactions of that sort. This happened in the month of March during Lent, in the fourth year of Cyril's episcopate, under the tenth consulate of Honorius, and the sixth of Theodosius (415 C.E.). And in those days there appeared in Alexandria a female philosopher, a pagan named Hypatia, and she was devoted at all times to magic, astrolabes and instruments of music, and she beguiled many people through (her) Satanic wiles. And the governor of the city honored her exceedingly; for she had beguiled him through her magic. And he ceased attending church as had been his custom....A multitude of believers in God arose under the guidance of Peter the magistrate – now this Peter was a perfect believer in all respects in Jesus Christ – and they proceeded to seek for the pagan woman who had beguiled the people of the city and the prefect through her enchantments. And when they learned the place where she was, they proceeded to her and found her seated on a (lofty) chair; and having made her descend they dragged her along till they brought her to the great church, named Caesarion. Now this was in the days of the fast. And they tore off her clothing and dragged her [till they brought her] through the streets of the city till she died. And they carried her to a place named Cinaron, and they burned her body with fire. And all the people surrounded the patriarch Cyril and named him 'the new Theophilus'; for he had destroyed the last remains of idolatry in the city. The Suda, a tenth-century Byzantine Greek encyclopedia of the ancient Mediterranean world, apparently by a Christian author, praises her as a wise philosopher and virtuous woman who remained chaste until her death, and accuses Cyril of being responsible for her death. Though Hypatia is often thought to have been in her forties when she died, recent scholars suggest that she was actually born around 350 C.E. and died at a more advanced age. ↑ Letter 154 of Synesius of Cyrene to Hypatia. (Online version). ↑ John, Bishop of Nikiu: The Life of Hypatia. Chronicle 84.87-103 (Online version). History of "Hypatia of Alexandria"
This page was last modified on 23 January 2018, at 15:31.